Overview: The Kazakhs are a Central Asian, Turkic-speaking people whose vast homeland, Kazakhstan, is located between the Caspian Sea, the Urals, and the Tien Shan Mountains in northwestern China. Islam was introduced to the ancestors of modern Kazakhs during the 8th century when Arabs first entered Central Asia, and Sunni Islam predominates today. Warfare between various tribes characterized much of their history but sometime around the beginning of the 16th century a unified Kazakh (Qazaq) identity emerged. 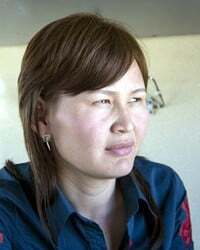 While the influence of tribalism continues to fade, it is still common for Kazakhs to identify themselves to other Kazakhs by their native tribe. -- James S. Olson, An Ethnohistorical Dictionary of the Russian and Soviet Empires. Westport, Connecticut: Greenwood Press (1994), pp. 354-367.